Outstanding. 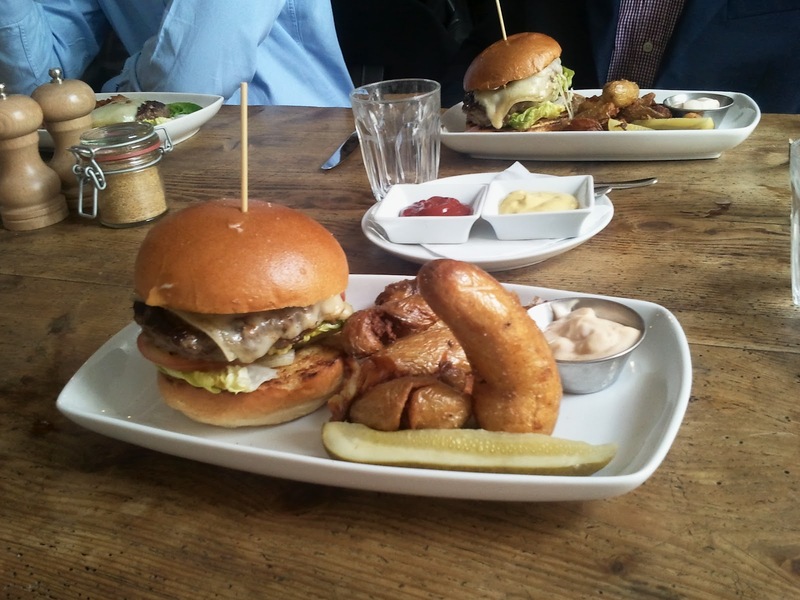 Notwithstanding the fantastic phallic ratte potato, this burger is presented beautifully. Miller's Brioche bun skewered with a wooden steak. 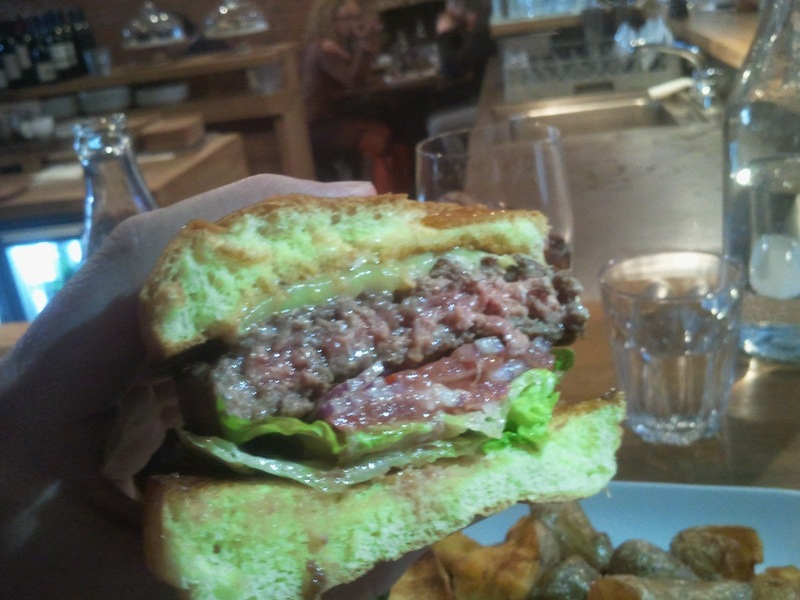 Maybe to stop the rare breed burger rising from the dead? Two spears of pickle and a pot of chipotle mayo complete the ensemble. Is that a ratte potato on your plate, or are you just pleased to see me? Comté cheese, tomato, gem lettuce, chipotle mayo. Topping the patty, the melted Comté gives a strong, sharp bite, coupled with the chipotle mayo which delivers a subtle, creamy, smokey taste. 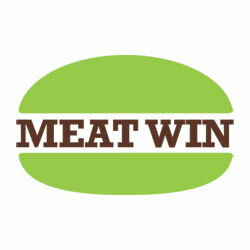 Underneath, sliced tomato, whole gem lettuce leaves, and sliced red onion all taste fine, but this is my one beef with this burger - not chopping your lettuce (and especially when using hard-stemmed lettuce like little gem) results in, in the words of Paul Simon, the burger slip slidin' away. Rare breed. 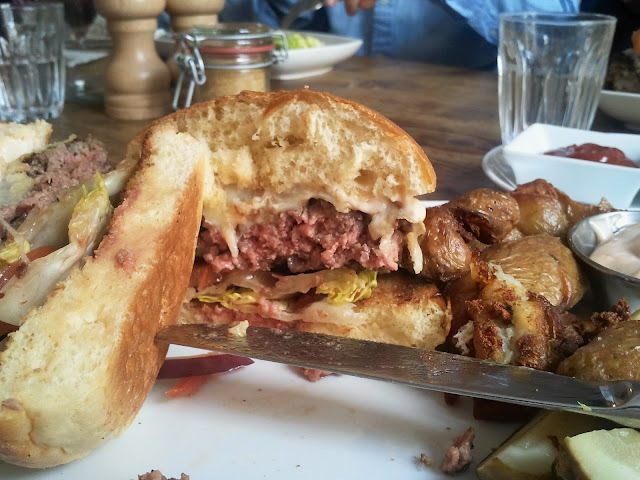 All the beef (and indeed all the meat at Workshop Coffee) comes from The Butchery on Maltby Street. I've had the White Park burger here, and the Dexter. Both cooked perfectly medium-rare, seasoned to perfection, and bloody delicious. 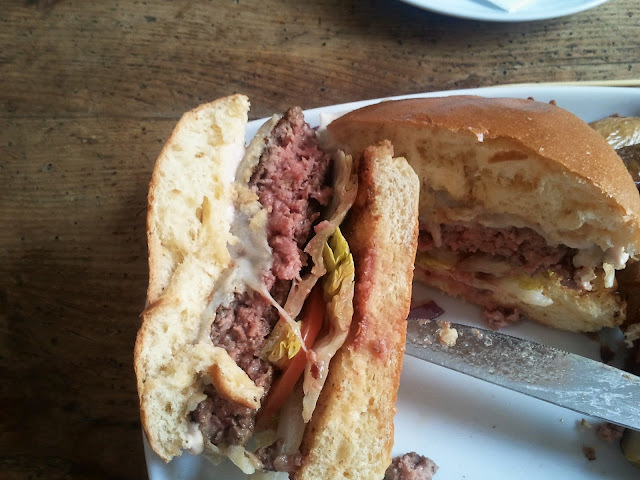 There's something immensely satisfying about eating two burgers, composed in the same way, but with beef from different breeds and despite being different in flavour (the white park was deep, mellow and beefy, the dexter slightly sharper/tinnier) and yet still working perfectly in combination with the rest of the burger. Excellent. This is the classic brioche bun from Miller's of Wimbledon, used by Bread Street Kitchen, Hawksmoor, The Admiral Codrington, and many others across London, simply because it's soft and strong. A bit like the Andrex puppy. More delicious chipotle mayo, and deep fried ratte potatoes. For a definition of ratte, see new potatoes, with more nutty/buttery flavours. They're also squashed so the deep fryer fat can get them nicely crisp. In short, they're great. 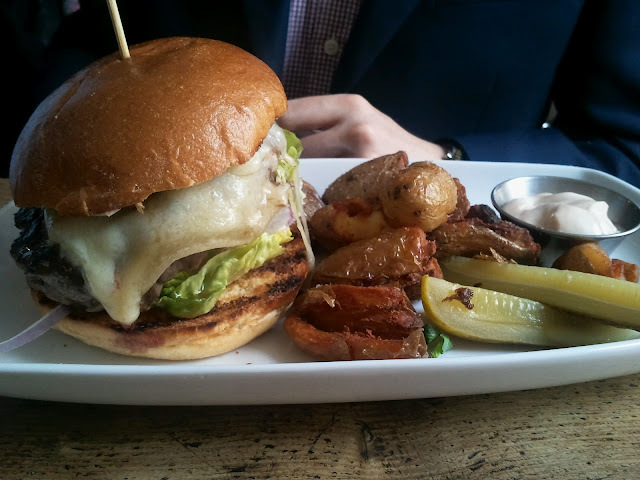 This is a cracking burger. Great meat, top-drawer bun, great cheese and condiments, and fabulous potatoes - but falls short of top marks for the slidin' lettuce fail. Not a big complaint in the grand scheme of things, but enough to slightly nark me. I will always love Workshop Coffee for delivering me a £4 mimosa at 8:01 am on a Sunday when I was severely jetlagged (ie, feeling like it was early evening). Good quality, good value early morning Sunday booze is rare in London, and it was exactly right. I'm glad the burger is quality too!